Over the past four months, Andrew Wiggins has helped strengthen his case for being the best young prospect in the world. Blessed with having two parents who possessed the genetics and self-discipline required to be world-class athletes, Andrew has not squandered his opportunity. 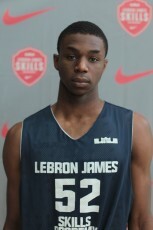 This April, at the Nike Hoops Summit in Portland, Oregon, the then high school sophomore captured the MVP Award after he helped lead the World Team Select by scoring twenty points and grabbing seven rebounds to an 84-75 victory over Team USA Select, featuring some of the best American talent, including Shabazz Muhammad, Kyle Anderson, and Rasheed Sulaimon. The 6'7" Canadian followed that up by bringing his mix of elite athleticism, improved skill, scoring prowess, and competitive gusto to his balanced and deep AAU team, CIA Bounce, where they went on to dominate the Nike EYBL season, winning seventeen of their first nineteen games. Wiggins averaged over eighteen points and nearly six rebounds over the lengthy regular season, which included stops in Oakland, Dallas, Minnesota, and Virginia. In June, the patriotic young wing competed with the Canadian U-18 team in Brazil, where he averaged a team-leading 15.2 points, 7.6 rebounds, and 2 assists at the FIBA Americas U-18 Championships. This July, he has continued his whirlwind tour by first heading to Las Vegas for the prestigious LeBron James Skills Academy. Even amidst some of the exceptional talent accumulated by Nike for this year's version of their All-American camp, Andrew Wiggins, who enjoyed the playing style of Allen Iverson, stood out with his performance on both ends of the court. Pressure can break some young men, but, although he later said he was nervous before the game, he shined in front of the United States Men's Olympic team, including his favorite current NBA player, Kevin Durant, at Durango High School in Las Vegas. After that event, he then headed to Alexandria, Virginia and later Washington, D.C., where he helped lead Canada to the Finals of the Nike Global Challenge. In the Championship game, Andrew Wiggins, who enjoys a 6'11" wingspan, rose to the occasion, scoring twenty-four points, snatching seven rebounds, and creating four steals in a narrow defeat. At his most recent event, the Nike Peach Jam, competing against arguably the best AAU teams in North America, Andrew took his game to greater heights. 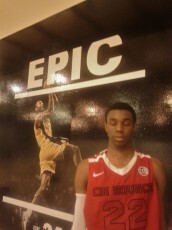 In his seven games in North Augusta, SC, Wiggins averaged twenty-two points and nine rebounds, while leading CIA Bounce to the Peach Jam Finals, before suffering a painful one point defeat, 51-50, to the Oakland Soldiers. In the Championship game, while guarded by a versatile and tough defender in Stanley Johnson, Wiggins generated twenty-three points, nine rebounds, and swatted three shots. Genetically significant, his father, Mitchell, was an honorable mention All-American at Florida State and a first-round draft pick in 1983 for the Indiana Pacers. Mr. Wiggins, who was born in Kinston, North Carolina, played shooting guard professionally for a span of sixteen years, including six in the National Basketball Association. Andrew’s mother, Marita Payne-Wiggins, originally from Barbados, was an All-American track star at Florida State, where she met her future husband. At age 23, the 5’8″ track star, won two silver medals, representing Canada, in the 4 x 100 meter and 4 x 400 meter relays at the 1984 Summer Olympics in Los Angeles. More than twenty-five years later, she still holds the Canadian women’s outdoor record for speed in both the 200 meter (22.62 seconds) and 400 meter (49.91 seconds). Although Mrs. Payne-Wiggins didn’t win another medal, she competed for Canada in the 1988 Seoul Olympics as well. Andrew played briefly in America during the 2009-10 season for Ro Russell and Christian Center Faith Academy in Creedmoor, North Carolina, a thirty-minute drive from the Duke campus. Wiggins’ parents elected to take him back to Canada to go to Vaughan Secondary School, just north of Toronto, for one year. While competing for the Vaughan Voyageurs, the nearly 6’7″ wing averaged twenty points per game. In his only high school year in his native Canada, Wiggins enjoyed a storybook ending, scoring twenty-five points and grabbing thirteen rebounds in the gold medal game to lead Vaughan to a OFSAA AAAA Championship. A year ago, Andrew Wiggins and his family decided to take his talents to Huntington, West Virginia, where he attends school at St. Joseph's Central Catholic High School, lives with a host family, and plays basketball for Coach Rob Fulford at Huntington Prep. Andrew liked the improved competition in both practice and games in America, the familiar camaraderie of knowing several of his Huntington Prep teammates through the CIA Bounce AAU basketball program, and the college-level facilities available through Huntington at Marshall University Recreation Center. After a stellar 28-2 sophomore season at Huntington Prep, which included trips to Ohio, Illinois, New Jersey, Canada, and Washington, D.C., the accolades flooded in for the soft-spoken young man with a loud game. Andrew Wiggins, who very well may be the best Canadian basketball player since two-time NBA MVP and eight-time NBA All-Star Steve Nash, was named the MaxPreps Sophomore Player of the Year nationally and won the Gatorade Player of the Year in West Virginia after averaging more than twenty-four points, four assists, and nearly nine rebounds per game on a deep Huntington Prep Express squad. Off the court, he earned a solid B average at St. Joseph's Central Catholic High School. Basketball can be a mercenary's life, but Andrew will enjoy the stability of being back at Huntington Prep for, at least, one more season. Seemingly every year, there is a new middle-school phenom unearthed and hyped as the "next big thing," but, for a variety of reasons, a very small percentage ever ultimately live up to the initial billing. When Andrew was thirteen, a highlight video or mixtape, which has now been viewed more than 4.1 million times, spread virally throughout the internet, billing him as "the best thirteen year-old on the planet." Now, at seventeen, with significantly more skill and physical development, he has managed to navigate the waters and be even closer to realizing his ultimate potential, through sheer competitive drive, guidance, and maximizing his natural talent. In an ongoing interview with the friendly Andrew Wiggins, who visited Duke when he was younger, we spoke about a variety of topics, including his lethal mindset when he steps on the court, Duke's interest in him, and playing in front of LeBron James. How has the transition to Huntington Prep gone and what you’ve gained from that experience? It’s been good…probably because I knew a lot of people and know a lot of people from AAU or other things. That’s helped a lot. They've helped treat me like I’m family. You actually lived with a host family. How has that aspect of the experience gone so far? Oh, that’s been great. They’ve been treating me like it’s a real family. They’ve taken me into their home, they help me out when I need it. They’ve acted like parents. They’ve been really nice to me. You’re lucky in that regard. For the audience that may not know, you go to a local Catholic school, but you play for Huntington Prep. Explain how that works. It’s probably a solid school. Yeah, it’s a private school, it’s a great education. Teachers support us 100%. They’ll help us when we need help. I saw that you had a B average this year in school. Exactly, that’s a casualty I don’t want to hear about. What are you working on most over the last year in terms of skills, body, etc.? I would think my shot has improved a lot. That would be the thing that people would notice most? Yeah, that and my ball-handling, probably. Playing without the ball. There’s been some talk about you re-classifying. Maybe you will, maybe you won’t. Can you address that issue? Oh, well, that’s something I haven’t really thought about yet. I didn’t mean to put you on the spot. Alright, we’ll move on. You’ve had a lot of international experience. How do you think that’s benefited you? What was the Nike Hoops Summit experience like for you? The international experience has been great. You get to meet new people. Yeah, that’s cool and we’re all friendly. We love each other. And, in terms of the Hoops Summit, you got the win. Yeah, that was good. I thought I played a good game. I got my shots. My shots were falling. I had a lot of fun and a lot of support from my teammates. They’re all friendly. 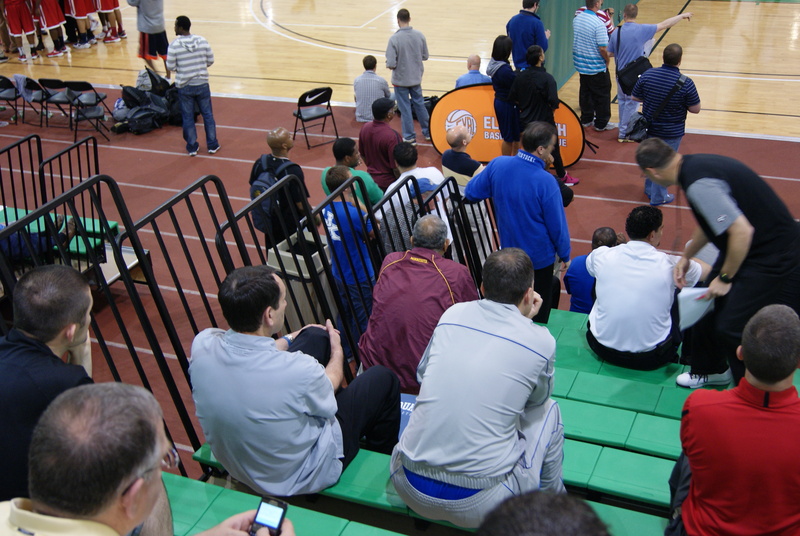 Now transitioning into EYBL, can you compare this year versus last year in terms of experience? How have you benefited? Well, this year and last year, I think our teams are great. Last year, I think we did great. We went to Peach Jam. We played good. Last year, we didn’t win it, but we still went out hard. This year, I think we’ll win it. I think we actually have a better chance of winning it this year. Our team is pretty deep this year. Pretty balanced. Last time we talked about working out with your Dad. Do you still work out with him in the off-season and, if so, what do you try to work on most? Oh, yeah, yeah, I definitely work out with him. He teaches me a lot. Well, he was an ex-pro, that must help a lot. What does he teach you? He tries to tell me what he knows and what it will take to get to the League. What advice does he give you now? I know in the past, he would always try to tell you to stay humble. I saw that your brother committed to Wichita State. What was your and your family’s reaction to that? Yeah, I was happy for him. He had a lot of options. He was looking at Baylor, Oregon, but he felt most comfortable at Wichita State. Are you guys pretty close? Oh, yeah, we play all of the time. We’re very close. You guys must kill it at the local YMCA when you two walk in. I was looking back at a prior interview with you. You said defense is where you wanted to focus a lot of your energy. How would you assess that aspect of your game at this point? I’ve tried to improve my man defense and my off-the-ball defense. I try to really get up on my guys. I’d say that my man-to-man defense is pretty good at this point, actually. What’s your current height, by the way? Is the number one ranking still very important to you? I know in the past that was something that you were striving for. I would say more than anything, it would really be an honor to me. I don’t want to say it’s incredibly important, but it would definitely be an honor and something I’m certainly shooting for and working hard to get there. Talk about Allen Iverson being your role model. Well, not role model, but someone you’re trying to model your game after. Oh, oh, I wouldn’t say role model. (laughs) What I liked about him is he was under 6’, he was under-sized, but he could score whenever he wanted to. He played hard both ways and we really don’t have any superstars like him anymore. He helped them to the Finals. I would think to a degree that you would try to model your game after guys like LeBron, Kobe, and Kevin Durant. Oh, yeah, those guys are all like the best players in the League right now. For better or worse, I just thought those guys are versatile wings like you. My favorite player in the League right now is Kevin Durant, but probably all-time is still Allen Iverson. It's amazing to me that he was able to get his team to the Finals and play like he did at that size. The only time I ever spoke with him was the day before he was drafted. He had an amazing watch on his wrist. I used to like to watch how he used his hands and feet on defense. He had an amazing ability to rip point guards with weak crossovers. Your parents both went to Florida State and you grew up as a Florida State fan from a very young age watching them on the television. It’ll obviously have some influence on your decision. Yeah, it’ll definitely have an influence on my decision and Florida State did big things this year, but I still have to make my own decision. You had mentioned in the past that you appreciate playing such a tough schedule. How would you assess the competition this year and compare it to what you faced in Canada last year? The competition this year was very good. It’s a lot different than Canada. A lot of people knock Canada. Oh, no, I wasn’t trying to insult Canada at all. I love Canada. (laughs) Yeah, me too. I wasn’t trying to knock it either, but the people are a lot bigger and stronger down here. Well, there’s a lot more people. Yeah, there definitely is a lot more people and, yeah, the competition is much better down here. Who will you turn to for guidance whenever you do make your college decision? It will pretty much just be my parents. Coach K was watching you earlier in the year. Can you talk about that? It’s an honor. He’s a big-time coach. He’s been able to coach and develop some great players. I watched a game there a couple of years ago. It’s a great basketball program. They’ve been winning for a lot of years. They’ve developed a lot of pros. They play really fast and fun. Well, you actually lived in North Carolina for a couple of months a few years ago, but we don’t need to talk about that. What has it been like to have Tyler Ennis as your point guard? Oh, he’s a great point guard. He’ll find you wherever you are. He’s a pass-first point guard and he has to be ready to get the ball. He’s very fast in transition. He’s very unselfish. He’s very efficient as well. Oh, yeah, he definitely is. He’s a smooth passer. He can score whenever he wants to score. What do you think he’s like off of the court? Oh, he’s a great kid off of the court. He’s unselfish, he’s humble, he’s friendly. He’s a good person to be around. One of the things you wanted to improve on was your three-point shooting. You can be a tough self-critic, but how would you assess your three-point shooting at this point? I think I’ve actually improved a lot since last year. I feel much more comfortable shooting the ball up there. I’ve tried to take away my weaknesses. Yeah, I think you have in terms of the three-point shooting. Last year, you felt comfortable anywhere from your mid-range and in. I think the word you said was you could “kill,” but you wanted to push it out this year. Your handle is another thing you wanted to improve on. You mentioned that you think that was something that you improved on. Yeah, that’s been an area I was trying to work on all winter. Have you taken any visits and or do you have any planned? Well, I visited unofficially to WVU. That’s a pretty local school. Yeah, exactly, it was pretty close to me and I don’t have any plans at this point, no. What about your strengths? You look a little more ripped in your arms, so to speak. Is that something you guys work on at Huntington? We work hard on and off the court. We play hard on the court and in the weight room. Do they have a good weight room facility there? Oh, we have great facilities there. Who would you say the toughest competitor is that you’ve ever gone against? Would Shabazz be up there? Oh, a little hometown shout-out! (laughs) Yeah, he’s my boy. Do you have any lingering injuries? Well, my back hurts just a little bit, but it's nothing. I’ve seen you lying on the floor occasionally. I just hope everything will wind up being okay for you. Now, in terms of Huntington, you’re going to go back next year. Is that definite? What’s the latest in your recruitment? There’s not really any new schools? It’s the same schools that have in there. For the sake of the fans and my writing, can you please reiterate what schools are in the running? I just want it for the record. Florida State, Kentucky, Duke, Syracuse, UNC. What was it like playing in front of LeBron? Oh, that was great. It was like a once in a lifetime opportunity. It was a huge opportunity and a real honor. I was a little nervous before the game. You know, these guys are big-time players and they’re coming to watch you. Well, the only guy I know at all on the team is Kyrie and I just quickly tried to tell him to make sure to watch you. Oh, yeah, thanks. It was a great experience and a real honor to play in front of those guys. I thought you played well, too. Have you felt any changes in your recruitment now that these coaches are allowed to text all of the time? You mentioned before that Duke is recruiting you. What do you know about the program? Yeah, they've been speaking with my coaches. It's obviously a tremendous basketball program and a great school. Coach K is a legendary coach and now he's working with the Olympic team. They've had great players develop and play at Duke. I visited the school when I was younger. They've been winning for a long time. You guys are traveling like crazy, but what are you working on most on your down period? When I get a chance, I work out with my AAU coach and my dad. We’re working mostly on jump-shots whenever I’m home. I try to work out really hard whenever I’m home. By the way, are you ever home? What’s the story with that? Are you ever home? What’s your mind-set whenever you’re on the court? Is it attack? In the past, you said like to think of you as a killer or that others think of you as a killer on the court. Yeah, I guess I would say more than anything, I just to kill them. (laughs) That’s what I love about your game- that you have an absolutely killer attitude, totally cold-blooded. Yeah, I just try to play my game, play hard, and take the other guy out. Would you say you try to intimidate guys? No, I can’t say that. What I would say is that when I step on the court, if they’re not intimidated, I’ll try to, well, they’ll…. (laughs) Yeah, they’ll see very soon learn that they should be. By the way, what does your father think of all of this? The success, the notoriety, your recruitment, your development? Oh, he’s very proud of me. He sees me working very hard in the gym. Did he think this would happen for you? Oh, yeah, he always thought since I was really young that I would be up for something special. He told me that I would be something special, very special. Yeah, well, hopefully, he turns out right. It looks like you've got a good head-start. I just want to make the ESPN tournament at the end of the year and win it. I’d really like to go undefeated. I’d just like to keep improving my game, that’s all. Lastly, I've mentioned this to you before, but I'm counting on you to bring a little basketball glory to the name Andrew. You and Andrew Harrison are my two current hopes. We've got Drew Breeze and now Andrew Luck in football, but Bynum is just not cutting it. You're my hope. I'm looking for single name recognition like Kobe, Shaq, or Michael. (laughs) All right, I'll definitely try. Thanks a lot for your time, Andrew. Out of a country that historically has championed hockey, there has been a basketball sensation named Andrew Wiggins, who has generated a great deal of interest internationally. At thirteen, an internet highlight video of him playing basketball spread virally and has generated nearly 2.7 million hits. Last summer, as a fifteen year-old playing for Canada at the FIBA 17U semi-finals in Hamburg, Germany, the Ontario native scored 20 points on seven of thirteen shooting against a loaded Team USA squad in a loss. Wiggins followed that performance up by scoring twelve points in helping Canada earn a bronze medal with a narrow 83-81 win against Lithuania. Genetically, he's been blessed by having two world-class athletes as parents. His father, Mitchell, was an honorable mention All-American at Florida State and a first-round draft pick in 1983 for the Indiana Pacers. Mr. Wiggins, who was born in Kinston, North Carolina, played shooting guard professionally for a span of sixteen years, including six in the National Basketball Association. Andrew's mother, Marita Payne-Wiggins, originally from Barbados, was an All-American track star at Florida State, where she met her future husband. At age 23, the 5'8" track star, won two silver medals, representing Canada, at the 1984 Summer Olympics in Los Angeles. More than twenty-five years later, she still holds the Canadian women's outdoor record for speed in both the 200 meter (22.62 seconds) and 400 meter (49.91 seconds). Although Mrs. Payne-Wiggins didn't win another medal, she competed for Canada in the 1988 Seoul Olympics as well. Andrew, the middle of five Wiggins children, played briefly in America during the 2009-10 season for Ro Russell and Christian Center Faith Academy in Creedmoor, North Carolina, a thirty-minute drive from the Duke campus. Wiggins' parents elected to take him back to Canada to go to Vaughan Secondary School, just north of Toronto, for one year. This season, while competing for the Vaughan Voyageurs, the nearly 6'7" wing averaged twenty points per game. In very likely his only high school year in his native Canada, Wiggins enjoyed a storybook ending, scoring twenty-five points and grabbing thirteen rebounds in the gold medal game to lead Vaughan to a OFSAA AAAA Championship. 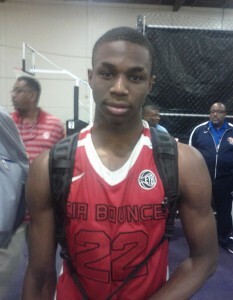 The now sixteen year-old Wiggins has joined CIA Bounce, where the 2014 prospect has been a major contributor (averaging nearly twelve points and over five rebounds per game) on both ends, for their 12-3 Nike EYBL campaign. This upcoming high school season, the oft described Canadian prodigy will very likely take his talents to an American prep school. Sixteen miles from where his mother won two Olympic medals, Andrew Wiggins, the confident but soft-spoken young man with a loud game, spoke with a lilting Caribbean accent to Blue Devil Nation. What's your current [private override_message="Just ahead is a 1600 plus word in depth interview with Wiggins, who says Duke is one of six schools to make contact thus far. By joining BDN Premium, you get access to this and all the latest information on the recruiting front. Wondering about the content here? Just go to "BDN Premium," articles and see just how many offerings we've had of late, "] size? What position do you view yourself as, a three or a two? I think of myself as a two. What schools are recruiting you? Florida State, Duke, NC State, Kentucky, LSU, Kansas State, Syracuse, and that's about it. Do you have a time frame in mind for when you'd like to decide by? I would say grade twelve year. Your father was obviously an NBA guy and your mother was an Olympic-level track star. Can you talk about their influences and how they may have helped you? Well, since they're both athletic, I have amazing genes. I can look up to both of them because they're both athletes. If I have any questions or doubts, I can always ask them. Yeah, I'm the middle child. I have two older brothers who play basketball and two sisters. So you can always ask their advice too? Do your parents tend to differ in terms of their advice, in that they come from different backgrounds or fields? They're both competitors and they both just want the best for me. Did you ever do track, by the way? (laughs) Just in public school... in Canada. Does it give Florida State an advantage with both of your parents having attended there? Probably a little bit, because my parents went there. Yeah. What advice has your father given you? Also, is he the type of father who wants to give you a lot of advice when you're on the court or is he the type that backs off and lets the coaches do it? Yeah, yeah, he does. He just tells me to play my game and also to work on my shot when my shot is off. Do you ever play against him, by the way? What's the best piece of advice he's given you so far? Just play the game like it's your last. What are your strengths and weaknesses? What would you say is your greatest strength? I would say my strength is attacking the basket or attacking the rim. What are you hoping to improve upon most this summer? This summer, I mostly want to work on my jump shot. What do you feel is your range normally? Where do you feel comfortable shooting the ball. I was watching out here tonight. Well, my shot was pretty off. I've seen enough of you before to know that you can shoot it a little bit. Yeah, thanks, I feel comfortable out to the three point line. I feel pretty much comfortable anywhere out to that. What style of play do you prefer? I would think with your natural ability you would like to go up and down. Yeah, definitely up and down. What are you hoping to show college coaches this summer in their limited time? I'd like to show them where my skill level is at and that my jump shot has improved. Who are the most difficult players that you've had to defend against? In Canada or the US? In the US, I'd have to say Michael Gilchrist. In Canada, I'd have to say Kevin Pangos. Is there a guy either in college or the NBA that you try to model your game after? Oh, yes, the one I try to model my game after is Kevin Durant. That's a good one to model your game after. Where do you plan on going to high school next year? Somewhere in America? There are rumors about Florida. (Laughs) Somewhere in America, that's all. Okay, somewhere in America, that's what we know. Who are some people that you'll turn to for guidance when you do decide? You've got that spin move and a crossover, but do you have a go-to move? Oh, yeah, I like to sweep right and either go all the way to the basket or step back and hit the shot. Do you have any visits planned to colleges? You're probably looking at high schools, right? Have you spoken to any college coaches lately? No, I can't speak to them. Will distance be a factor for you at all? Which do you prefer to defend? The two or the three? They tend to switch you a lot during games. I like to defend the two. They tend to be more high scoring and I like to shut them down. I try to take pride in my defense. What differences do you find between Canadian basketball and American basketball? The style of play and the competitiveness. Americans just seem to want it more and they're hungrier. They say you're the next big thing out of Canada. Can you give the audience a scouting report on how you play, how an opposing coach would describe you? I can defend well, I can defend any position. I can get to the basket, I can shoot jump shots. I can penetrate and kick. I think I can pretty much do anything I put my mind to. Speaking of your defense, I was wondering how you would assess it at this point? It sounds like you're pretty satisfied with it. Yeah, I think my defense is pretty good right now. Who are some guys nationally that some people might be surprised that you're close to? What tournaments do you have coming up for the rest of the year? Well, the rest of the BYBL, and then I've got national team tournaments for Canada. We're going to Cancun, Mexico for that one. That should be fun. What was it like representing Canada last year? It was a great experience. I got to play against some top talent. It's an opportunity to see where I'm at. Kyrie Irving from the US and Kyle Wiltjer from Canada said that it's such a great experience and bonding time. They talked about how it created a brotherhood in such a short period of time. Have any of the Duke coaches contacted you? What do you know about their program? It's a good program. They've got great players that come out of there, great coaches, and great fans, too. That's about it. What are your goals for next season? What are you hoping to accomplish? I'd like to be considered the best player my age. I was meaning to ask you about that. Is that important to you? Some guys shy away from it and others embrace it. I don't really think rankings mean that much, but it'd be nice to be considered that. I guess that's about it. Lastly, you've got a bright future on the court and seem to be nice off of it too. I need you to help resent for the Andrews out there. Bynum's been killing our name in LA lately. (laughs) Sure, don't worry. I'll represent. 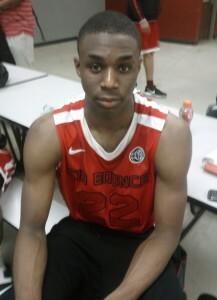 Here is part II of our Andrew Wiggins video interviews for BDN Premium members. Several media members descended upon the rising star with few knowing any tangible details as to who he is as a person and [private] player. 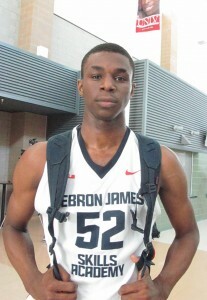 If you follow recruiting you have no doubt heard the buzz about Canadian Andrew Wiggins, a talented sophomore wing forward. Wiggins has been wowing folks be it on the AAU circuit for CIA Bounce or the Jordan-Brand International game where he was named MVP. 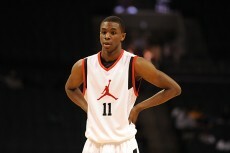 BDN took in his games at Boo Williams and followed his play up when we attended this past weekends Jordan-Brand affair. We bring you up close and personal with Wiggins where you can see BDN Premium exclusive footage as he talks recruiting and more, giving [private] a fan a good idea of who he is. This is the first two parts of three total, and the meat is yet to come. Get to know Wiggins with these two vids while we prepare the other and dig up out interview with him from Boo Williams. 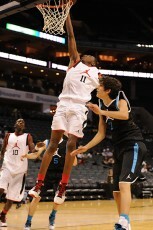 The Jordan-Brand All Star affair wrapped up this past weekend with the East holding on to take a 113-109 victory. BDN was front and center during the event and here are some observations from the game and behind the scenes at the event. -Just last [private] week WRAL ran a Rivers comment which basically said he had no hard feelings towards UNC and that he almost went there. From my understanding, they took just that clip from a 12 minute interview and ran it. Rivers is not aware of how "some" of the UNC fan base acts, nor that local media has a distinct slant there way, but he will learn. A chorus of boo's welcomed him when introduced as was Gbinije. Gbinije smiled and looked down at the court, while Rivers seemed surprised at first and then cracked a smile. In fairness, there were a whole lot of Kentucky fans there as well and they certainly do not like Duke. After the game, Rivers said there are more UNC fans and that was okay but he was starting to get an idea that while he may like them okay and not yet be into the rivalry, many of their fans will hate on you. Rivers was clowning with McAdoo as he was interviewed and the two had a friendship. FWIW, McAdoo is a class act and a good kid, hard to dislike if you will. Rivers also hung around Myck Kabongo a lot. -A Rakeem Christmas dunk strted the game off and for a quarter Rivers looked like the man. But you could almost see the descent on some of his teammates faces who wanted their points. He was open on the wings several times and didn;t get the rock and that eventually made him force some shots. Some fan was killing him, yelling "pass the ball," the whole first half. Michael Gbinije ended up forcing some shots as well and was a fish out of water in the sense that he is a team player. He still showed a nice soft mid range and three point touch. It is also clear that Brad Beal doesn't seem to like Rivers and he asked the west coach to let him guard him from the start. As you know, Rivers went off early, but Beal answered only most of his points came on wide open dunks off the break. -I had a VIP seat, front row, under the basket near the west bench. Several rap stars sat to my northeast and Oak Hill Coach Steve Smith was one seat over. Several ex players came by to talk to him including Stephen Jackson. Jackson and a temmate I didn't recognize sat to my right. Concessions people started bringing him food left and right or asking if he needed anything. He joked that he was looking for a call from Michael Jordan about eating junk food. When a Jordan video came on, you could hear some whispers which were jokes. I did see Jordan after the game in the corridor with a girlfriend half his age in tow. Several people quipped that the Bobcat's were not a smooth operation but I have no comment on that, just passing on what I overheard. -Marshall Plumlee was completely gunned out. A "gun" is an old school word for a player who jacks up shots and raely passes. I waited like 17 minutes for Plumlee to come out of the locker room, returned and still saw media waiting and just did not have time to get an interview with him. Plumlee seemed miffed when his coach put Jackson Simmons in ahead of him in the second half. He was not the only one. Jackson did battle his way to 8 rebounds though but he will never be a major factor at UNC. -Kids were all over the players, especially Rivers after the game as you may have seen in the raw videos we put up. Rivers gladly signed for fans and interacted with them. -John Wall came over to speak with Jackson and gave me a nod. And Mr. Clifton shadowed his every move. It has become clear that a certain group is taking care of Kentucky, Louisville and Baylor. Gee, I wonder is those handshakes we hear about happen. -Kentucky fans there seemed like a cross between passionate and crazy. Seriously, there were a lot of them and for good reason. Michael Gilchrist and Anthony Davis are going to be scary good from day one. Gilchrist seemed to be adjusting while Davis seemed to be realizing how hard he is to defend. -While McAdoo won the MVP for the East, his teammate PJ Hairston seemed lost and did not have a great game. Hairtson is accustomed to getting a lot of shots and will take them. It will be interesting to see how Williams gets kids minutes with everybody returning. The pressure started when Barnes said he was coming back. 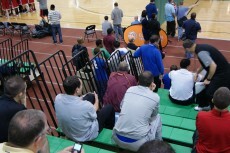 -DJ Augustine was also sitting on near me and he liked Myck Kabongo's game. Interestingly, once he made a comment on how he is quick and keeps his team together, the East had lost a big lead and were arguing with each other. -A guy tapped me on the back and wanted my autograph, saying you are a scout right. I smiled looked at Jackson and kindly said you don't want me to mess up that hat with all the autographs. Actually, I was just taking a cue from Harrison Barnes and playing rock star, LOL. -A Kyle Singler game alum video hit the screen up top and you guessed it, boo birds were at it again. Man, Charlotte is a UNC town, always has been and always will be. I wonder how many kids got an ear full from MJ who was pretty much the reason Barnes went to UNC. One Duke alumni, Jay Bilas, sporting reading glasses, got away with no heckles. Looks like his objectivity is working. Ever wonder why Duke alum don't spew the cracks UNC ones do?